On the 4th day Evening it was ‘Surya Prabhal’ in the morning and the cool ‘Chandra Prabhai’ in the evening for Sri Azhagiya Singar. Today, 21st June 2013 is ‘Aani anusham’ – the birth star of our Acharyar Nadhamunigal. 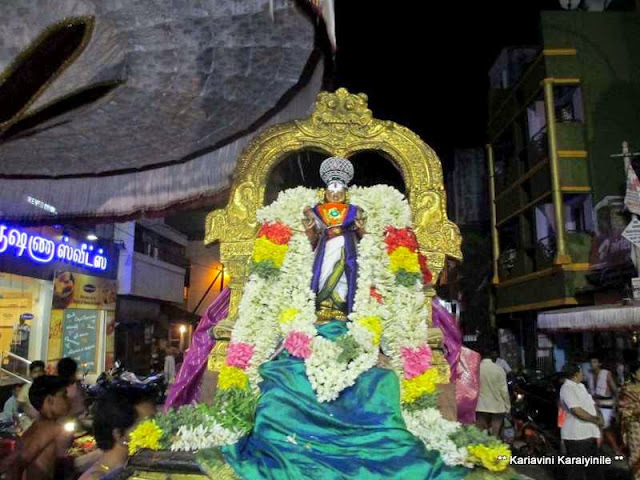 Acharyar Nathamunigal had purappadu with Sri Thelliya Singar. 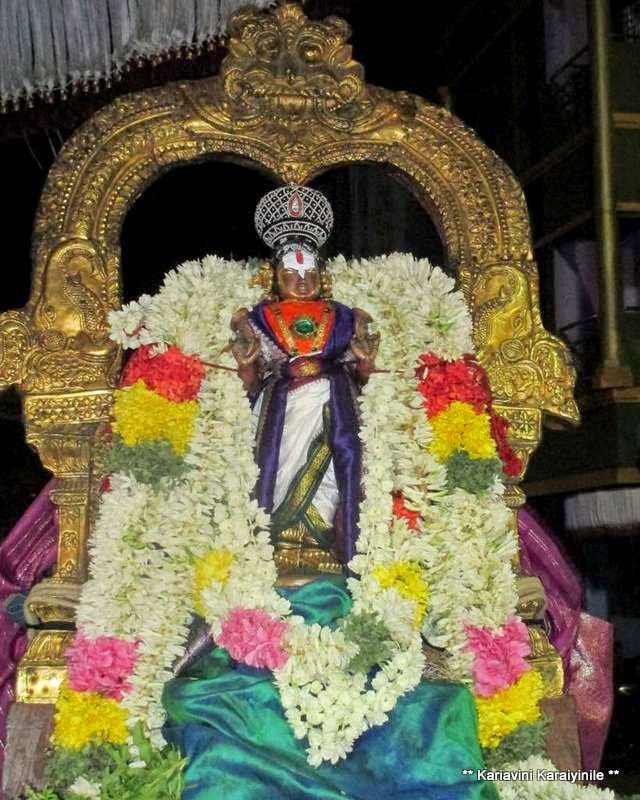 Sri Nadhamunigal was born at Kattumannar Kovil which has a big lake and known as Veeranarayanapuram after the presiding deity ‘Veera Narayanar’. The lake veeranam has its name thus. It is our Acharyars who steer us towards the boundless mercy of Sriman Narayanan. All of us daily start with our ‘thaniyan’..
யதீந்திரப் பிரவணம் வந்தே ரம்ய ஜாமாதரம் முனிம்! அஸ்மாதாசார்ய பர்யந்தாம் வந்தே குரு பரம்பராம்! This way, we hail our glorious preceptor Sri Nathamunigal as in the midst of all our Acharyars starting from Sriman Narayana, Srimath Lakhsmi Pirattiyar, Senai Muthalvar, Swami Nammazhwar ….then Nathamunigal… these Acharyars by their deeds and words have delivered us the tradition, wisdom and pride of being a Srivaishnavaite. After the great Azhwars, there was a period when the ‘divyaprabandhams’ rendered by them were lost in oblivion; it was Sri Nathamunigal who got them back; he is credited with the regenesis of ‘Divya Prabandham’. 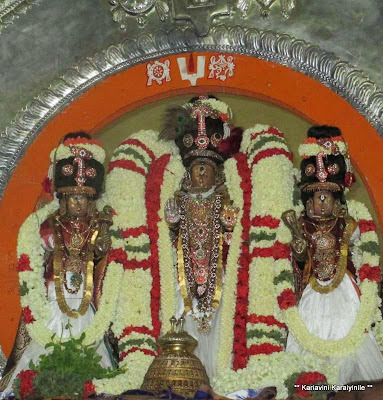 Sri Nadhamunigal was born in Anusha nakshatra of ‘Ani’ month at Sri Veeranarayanapuram [Kattumannar Kovil]. Sri Nathamuni went on a long pilgrimage that took him to Divya Desams like Mathura, Vrindhavan, and other holy places including Puri. 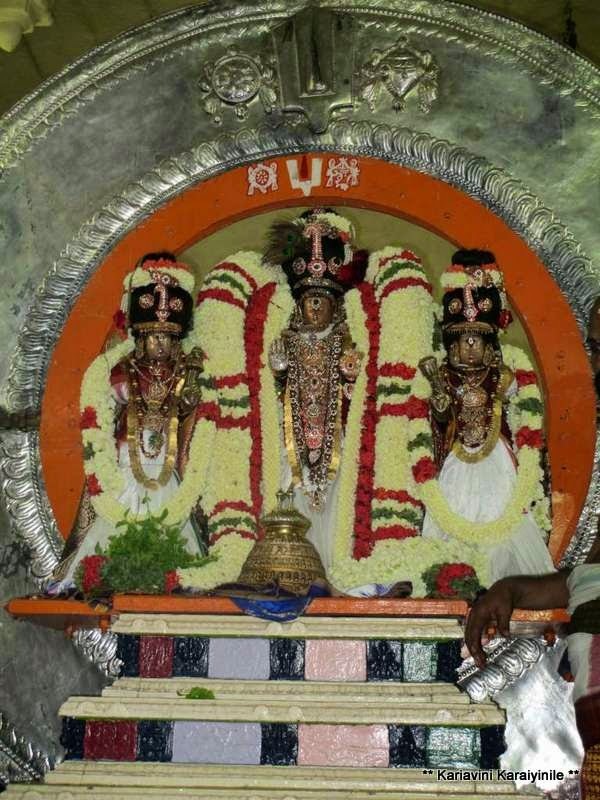 Upon hearing some Srivaishnavaites reciting Thiruvaimozhi pasuram ‘Aaravamuthe’ ~ he followed its trail tracing it to the Thiru Kurugoor; with the divine blessings, collated Sri Nalayira Divyaprabandham and thence onwards these hymns are continually sung in Divyadesams and other Sri Vaishnavaite temples, Dravida Veda. After him, the Guru paramparai mantle passed on to Uyyakondar, Manakkal nimbi and thence to Yamunacharyar @ Aalavandhar, the grandson of Natha Munigal. Nathamunigal was also a great Bhakti Yogi and practiced the Yoga of eight accessories ( ashtAnga yoga); he authored the treatise “Yoga Rahasya”. He was also an exponent of divine music who initiated the ‘singing of divyaprabandham ~ now known as Arayar Sevai’. 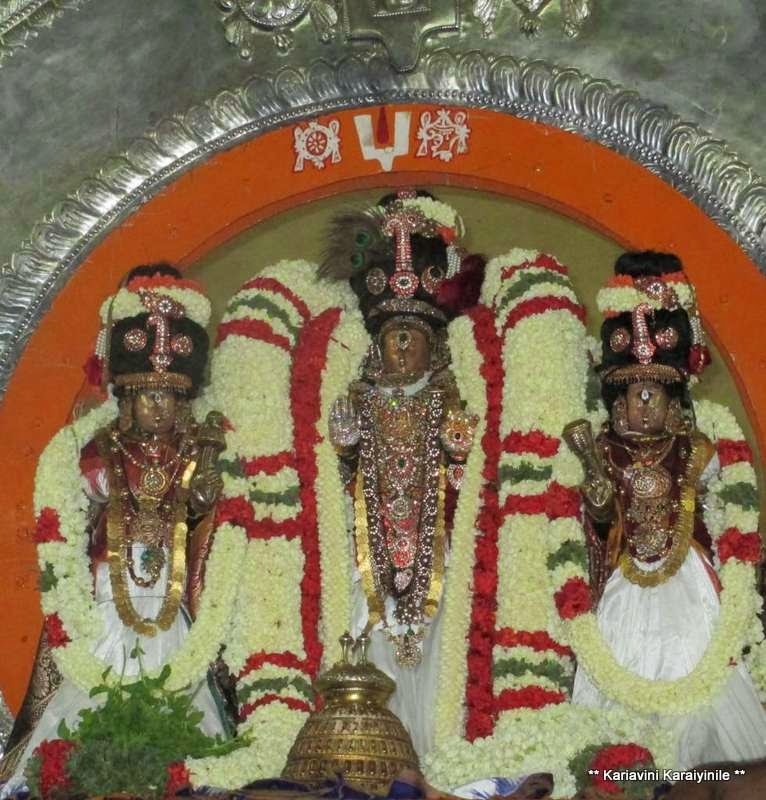 The seed for illustrious Sri Vaishnava lore and system was sown by Sri Nathamuni, germinated in Sri Yamunacharya, attained pinnacle of its glory in Sri Ramanuja continues to flourish through Sri Vara Vara Muni and his successors. Salutations to Naatha muni who had the single minded devotion to the Lord and who is the treasure of both Gnaana and Vairaaghya. 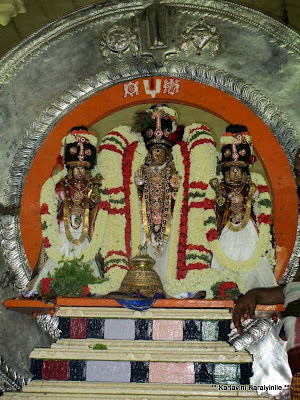 At Thiruvallikkeni Sri Nathamunigal had purappadu with Lord Azhagiya Singar in Chandraprabhai. 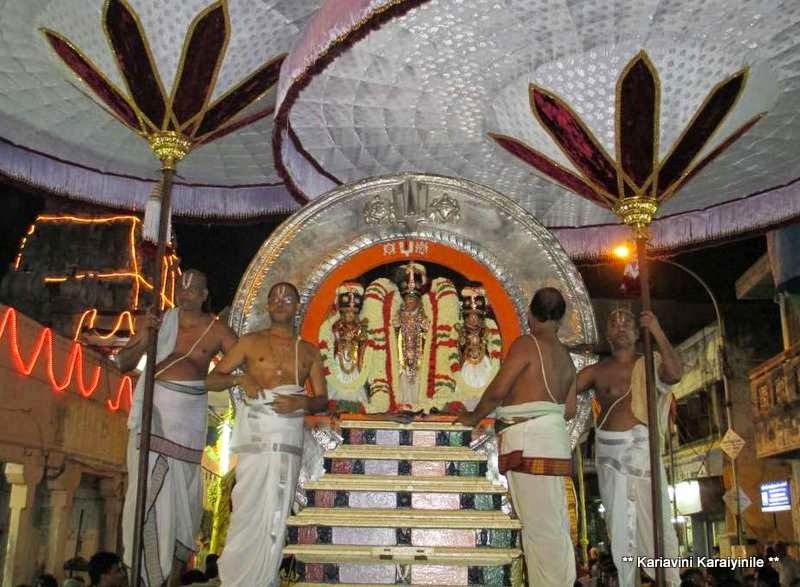 Here are some photos taken during the Brahmothsava purappadu of Sri Azhagiya Singar.